Candles by Victoria - Highly Scented Candles & Wax Tarts - Milkshake Candles - Choose your favorite! Home » Candles » Milkshake Candles - Choose your favorite! 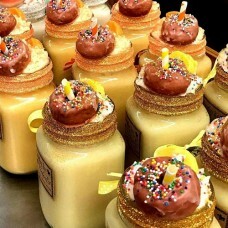 Milkshake Candles - Choose your favorite! Brand New for 2019, introducing Candles By Victoria Milkshake Candles!! We are so proud of this new line, can you say cuteness overload?!?! These sweet candles will brighten any room in your home and will put a smile on your face and will be a treat for your nose. Choose from our 6 amazing fragrances which include Banana, Chocolate Mint, Chocolate, Cookies N Cream, Orange Creamsickle and Strawberry! We worked very hard on this line of candles; we hope you love them as much as we do! * Prior to burning, please remove the straw and ribbon, these are for decorations only. You can also remove the wax donut and melt that in your warmer. Also, please burn candle on a heat safe plate as they may spill over during the first burn. Watch this YouTube video for a closer look and a detailed description of each one!